My brother is turning 40. Wow. And I’m not far behind. Sigh. (Scratch that, turned 40. I wrote this in January.) My brother is a video game fanatic. He has an old school arcade game console in his basement that he somehow magically rigged up with a computer loaded with every arcade game ever invented. 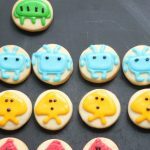 And so, here are some Pac Man cookies and a bonus arcade cookie. 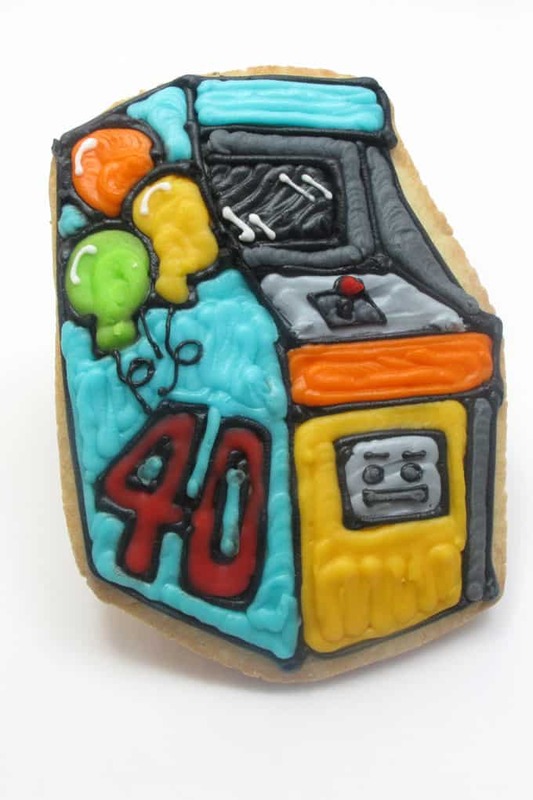 And as he is familiar with every arcade game ever invented I could’ve gone any route with these cookies. But while my brother is familiar with every arcade game ever invented, I am not. My knowledge is limited to my ’80s video game years and Pac Man. 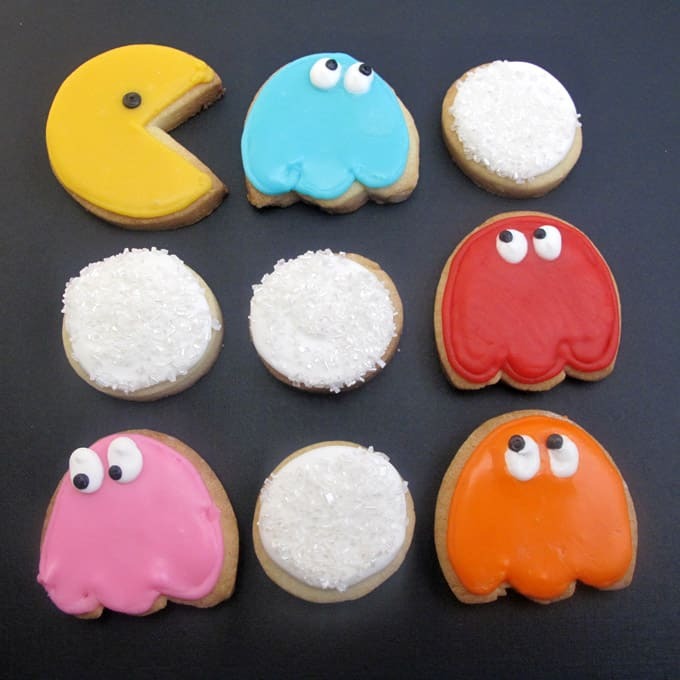 Hence, Pac Man cookies. Though I also play a mean Pitfall, Frogger and Asteroids (for Intellivision). 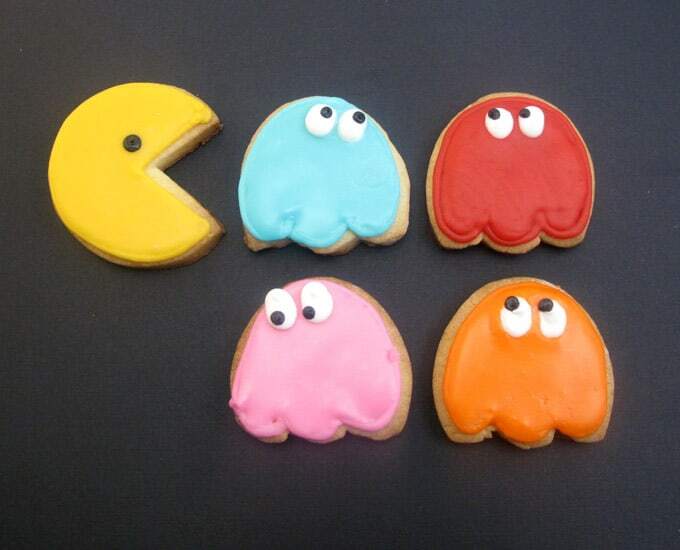 Need more ’80s video game cookies? 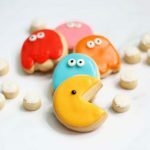 I updated these Pac man cookies here. Remember Space Invaders? I have the cookies. Or, another favorite: Frogger cookies. *For food coloring, I use Americolor soft gel pastes (Egg Yellow, Electric Pink, Red Red,Turquoise, Orange, Bright White, Super Black). For Pac-Man, I used a 2 inch circle, for the ghosts I used a 2 inch oval, and for the dots I used a 1 1/2 inch circle. 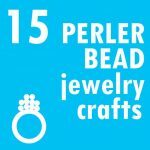 Find decorating bags (the 12-inch disposable), couplers, tips (you’ll need sizes “2,” “3” and “4”), sprinkles and likely the cutters in the craft store. 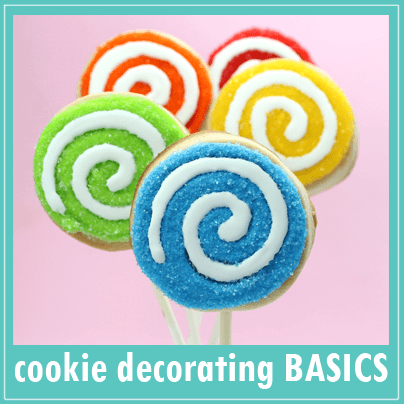 Click HERE for tips on finding cookie decorating supplies. Prepare cookie dough according to the recipe. Chill, roll out and cut out cookies. 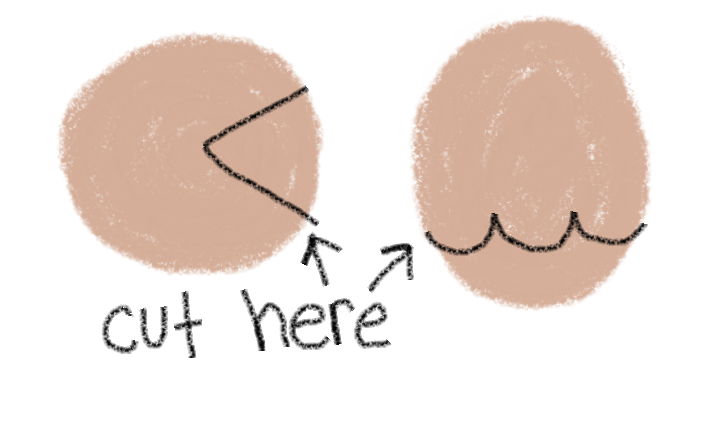 For Pac-Man, cut out a circle, then use a knife to cut out a wedge. For the ghosts, cut out an oval, then use a sharp knife to make three scallops, for the dots, just cut out circles. Bake and let cool. Prepare frosting. Prepare frosting bags with couplers and tips and fill with these colors: yellow, red, turquoise, orange, pink, white and black. Tie closed with rubber bands. 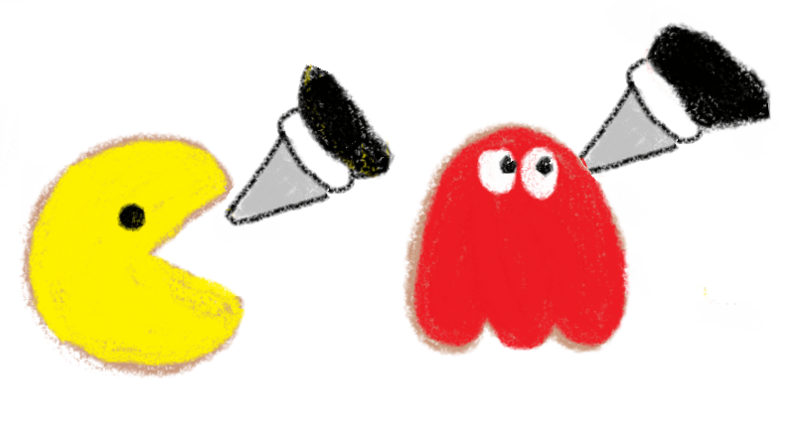 Using size “3” tips, outline Pac-Man in yellow and the ghosts in their respective colors (red for Blinky, pink for Pinky, blue for Inky and orange for Clyde). Let set about 15 minutes. 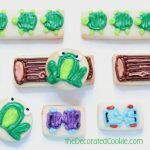 Flood cookies with the same color icing as the outlines. 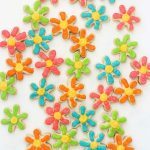 To flood cookies, squeeze some of the frosting from the frosting bag (this is easier if you take off the tip) into a bowl and thin with drops of water, stirring well, until the consistency of thick glue. Fill an empty decorating bag with the thinned frosting, snip 1/4 inch from the tip, then loosely pipe the thinned frosting on the cookie, starting around the outline, then back and forth in the middle. Let the icing flood to the edges, encouraging as needed with a toothpick. Let set well, several hours. For Pac-Man, pipe a dot using the black frosting with a size “2” tip. 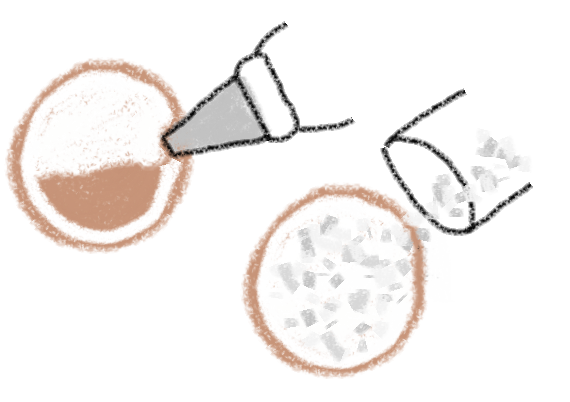 For the ghosts, pipe two dots with white frosting using a size “3” tip. Then pipe two small black dots. Let dry overnight. 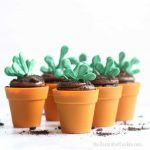 With white frosting using a size “4” decorating tip, pipe a circle and pipe to fill the dot. 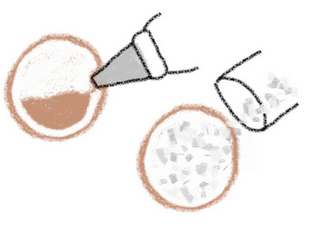 Immediately dip the top in sprinkles and shake off excess. Let cookies dry overnight. « finally…. a new book!!! The arcade machine is awesome and the little pac man cookies are sweet. 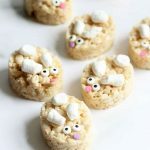 Such a fun set of cookies to make. Oh my god these are sooo awesome! Your brother must have been ecstatic 🙂 I would have been. Great idea and lovely execution. I wish I could draw little tuto like that. How much river my life would be, lol! As for the cookies, wow. I'm going to say, you just radiate cuteness and it gets on everything you touch! SOOO creative! Thanks for sharing! I LOVE this!! I just posted an 80's theme party we created. I wish we had your cookies!! 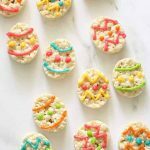 I found your site from DishFolio and my parents would absolutely LOVE these cookies! They are Pac Man fanatics (as in they play every night and try to beat each other's scores). I guess no matter how old you are, a good game of Pac Man always makes you feel young. 🙂 I am definitely making these for my folks. Thank you for the idea and for sharing! Fantastic cookies! Had to share the pancakes I made for last Halloween. 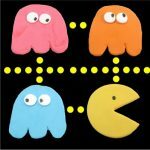 haha – love the pacmen ! What? No tutorial for an amazingly cute and detailed arcade game with balloons for a 40 year birthday?! Ha ha, just kidding. That cookie is crazy good though! And the rest of them are adorable as always! Yes, that did just make me laugh out loud, because I considered it!! This is a great gift. I love Pacman and still play it when I am near an arcade by the shore. Seeing this brought back fond memories of eating pizza, and using many quarters to play for what seemed like hours! Muy originales y graciosas estas galletas. Un besazo. I used to love pac man! Actually, i still do…lol. 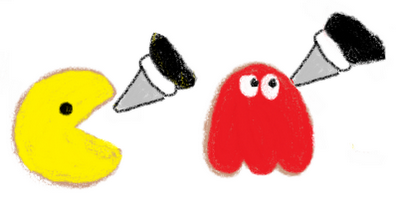 I recently downloaded the pac-man game on my ipad and it brings back such food memories…hehe. I'm having a huge '80s party for my 40th, still a couple of years away, but I'm bookmarking this. Perfect '80s cookies!!! Ok I am just now getting around to catchin up on all my favorite blogs. PAC MAN! 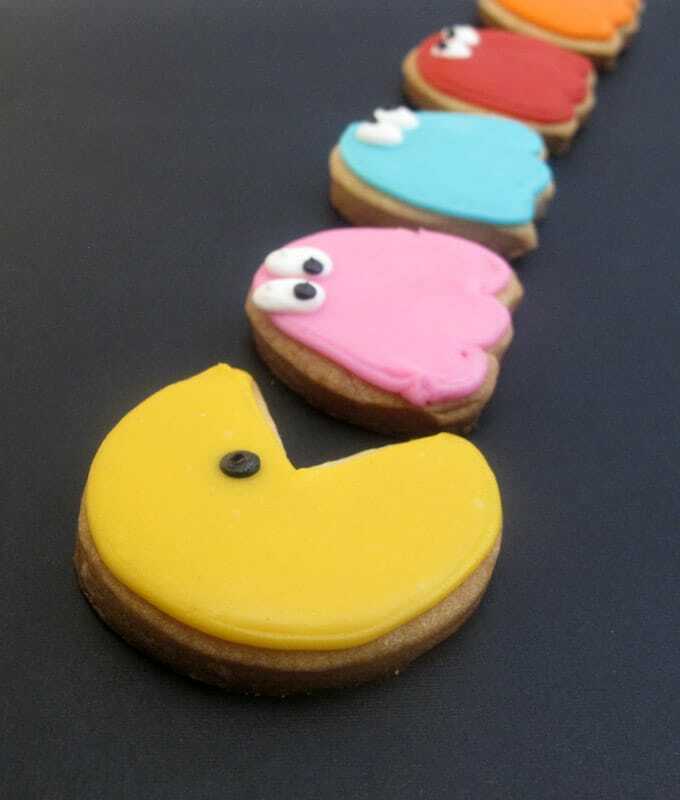 We must be on the same wavelength, I just sent off pacman cookies for my husband earlier this week!! Had no idea that you had done some! Yours are way adorable! 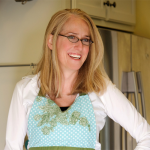 Hi Marg, I’ve had great success freezing decorating cookies! Wait until they are totally dry (best left overnight at room temperature). I usually place a few in a single layer in a gallon-size freezer-safe ziploc. But, THE MOST IMPORTANT part: To thaw, remove the bags from the freezer, but KEEP THE COOKIES IN THE ZIPLOCS until they are thawed, then open and remove.